Osaka has an excellent public transportation system, but if you have a lot of luggage then you might prefer to take a taxi. 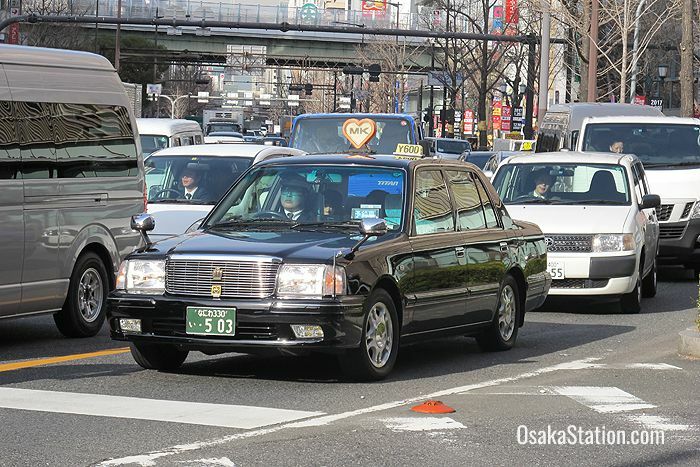 There are a lot of taxi companies in Osaka so it is very easy to hail a taxi wherever you are. Also, if there are two or more passengers to share the bill taking a taxi can be very economical. The base fare for a small taxi in Osaka is 660 yen for the first 2 kilometers and then an additional 80 yen for every 296 meters. Taxi fares do differ according to the size of the taxi. There are three basic sizes small (kogata 小型), medium (chugata 中型) and large (ogata 大型). Basically taxi fares will increase with the size of the taxi. A small kogata taxi can seat four people, but if you have more people in your group you will need either a bigger vehicle or a separate taxi. 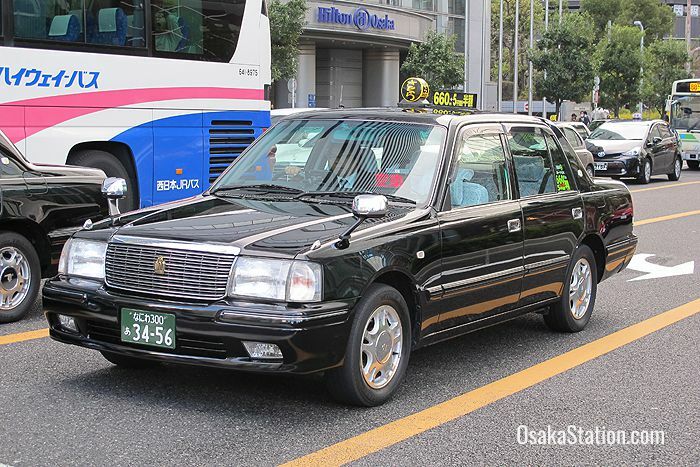 Taxi fares can also differ slightly between companies and you should also know that almost all taxi companies in Osaka charge a 20% surcharge between 23.00 and 5.00 the next morning. 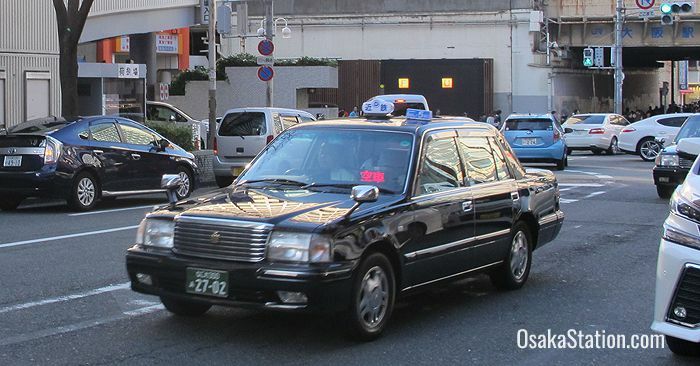 Hailing a cab on the street is easy in Osaka and you won’t have to wait long before you see an empty taxi. When you see an oncoming taxi, simply raise your hand as you would in your home country. If there is a green light in the passenger’s side window, then the taxi is already occupied. If there is a red light, then the taxi is available. At night, a light on the roof of the taxi also shows that the taxi is vacant. Although some taxi companies have a limited number of English speaking drivers, most taxi drivers cannot speak English. It’s a good idea to have a map to your destination prepared or the address written down in Japanese. With the address the driver can easily use the taxi’s GPS system to find the location. In Japan the rear doors of taxi cabs open and close automatically. You don’t need to open and close them yourself. In fact it is better if you don’t. All taxi cabs have meters, and most taxi drivers are honest. You generally don’t need to worry about being cheated by a taxi driver in Japan. Tipping is unusual in Japan. You should simply pay the fare shown on the meter. In fact if you try to tip the driver, you will probably just embarrass or confuse him. 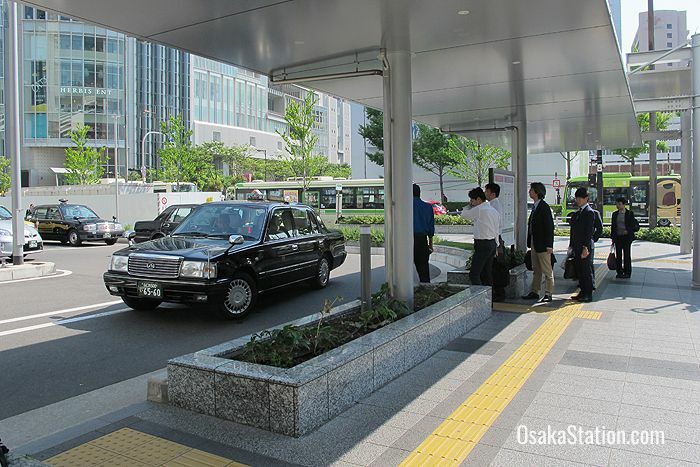 The taxi rank at Osaka Station is located on the south west corner of the station building just outside the Sakurabashi Gate. 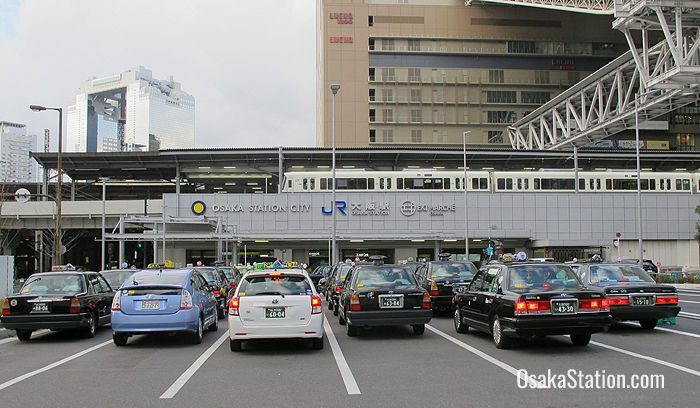 There are also taxi ranks outside other railway stations in Osaka and most major public facilities. 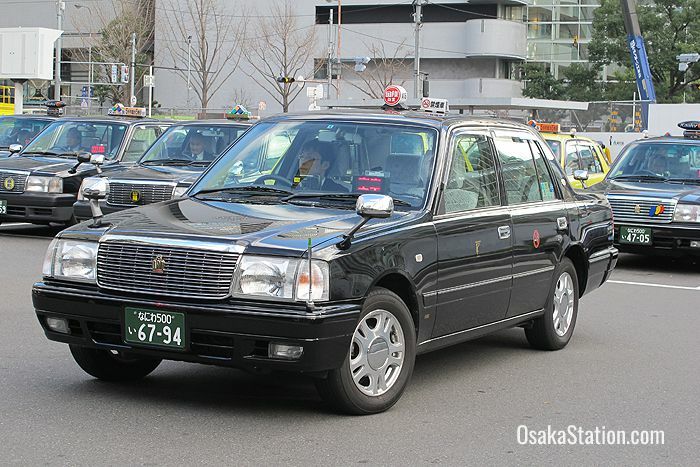 However, there are so many taxi companies in Osaka that it is very easy to hail a taxi on the street. At taxi ranks, the taxis line up and customers board them in the order they become available. For this reason, when boarding at a taxi rank, you cannot choose a particular taxi company. However, his is generally not a problem as most taxi drivers are very reliable, polite and honest. There are too many taxi companies in Osaka to list them all. Here is a short list of some of the bigger companies which have a good reputation for their service. Sakura Taxi accepts major credit cards. Though Sakura Taxi drivers cannot speak English, this company does have a 24 hour interpreter service for foreign travelers. If a foreign passenger needs help, the driver can call an interpreter who will then speak to the passenger over the in-car speaker phone. This service is available in 5 languages: English, Chinese, Korean, Portuguese and Spanish. Kokusai Kogyo (KKG) accepts both major credit cards for payment and the ICOCA prepaid IC card. A limited number of KKG drivers can also speak English. Kintetsu Taxi have some English information on their website. They accept major credit cards and also have a limited number of English speaking drivers. If you wish to book an English speaking driver you can call them on 06-6771-9031. MK Taxis has one of the best services available for foreign tourists in the Kansai region with special charter plans available for sightseeing, business travelers, and airport transfers. Their Osaka branch has its own English website, and they also have a special phone line for English and accept English emails. In-car interpretation services are available in three languages: English, Chinese, and Korean. To make enquires about their charter services call 050-3786-6001. This company also accepts major credit cards.